When I first heard from a friend, who was a diabetes educator, that there was a baby in foster care that had Type 1 diabetes and needed a home, all I could think was that the baby could be mine. My friend merely made the statement in passing: that she had just brought diabetes supplies to a beautiful mixed-race baby in foster care. She wasn’t looking for a response. Just making small talk. She couldn’t have known that my heart raced and that I began plotting at that moment how to approach my husband. She told our group of friends that the baby was diagnosed at one month old and would require insulin injections for the rest of her life. That was fine with me. I knew a lot about Type 1 diabetes. Diabetes had come to live at our home eight years earlier when my then-four-year-old son was diagnosed. I couldn’t believe that I might be so lucky as to be able to adopt a baby. My husband came from a Midwestern Mennonite family with five children. I came from an Italian Catholic family with six children. We always agreed that having a good number of siblings was a fun way to have been raised. Unfortunately, having married at 30 and having faced some fertility issues, we had a difficult time having biological children. Then, when Trent came, we felt very lucky. We tacitly agreed to accept whatever children God had in store for us. To much joy and surprise, Michela came two and a half years later. For the following eight years, I wasn’t exactly disappointed every month to find that I wasn’t pregnant. I got used to it. But silently, I did hope. I was not about to complain. We had one boy and one girl. They were healthy, beautiful and intelligent. Life had been good to us. Still, sometimes, I found myself looking on the internet at children waiting to be adopted. But when I broached the subject of adoption with my husband, he was not keen on the idea. He didn’t like the idea of “shopping” for a baby. When pressed, he agreed that if a baby was born that we heard about that needed a home, he would be open to adoption. With that in mind, I kept my ear open. When I first talked to my husband about the baby with diabetes at Catholic Charities, I was surprised to hear that he was immediately receptive to the idea. He knew that strong families could be formed through adoption. He has three siblings who were adopted. They are half-Jewish and half-black by birth and were adopted during the late 60s and early 70s when placing children of color into white families was unusual. We have a close relationship with all of them, especially his sisters who now live close by in New York. He agreed that we would be good parents to a child with diabetes with our experience. A mixed race child would be especially welcome in our family. The striking thing was that he confessed that it was difficult to voluntarily bring diabetes into our home. For the first time in eight years, he told me, “I hate diabetes.” I had never heard him say that before. I always thought that he saw diabetes as just another problem to be solved, like a math problem. (He comes from a long line of mathematicians; math and problem solving are hard wired into his brain.) I never knew he had strong emotions about diabetes. Wasn’t it he who taught me not to feel guilty about giving our son shots and to be thankful for every shot we had to give? To be greatful we live in these times because before the discovery of insulin in 1921 our son would be dead? Wasn’t it he who for years meticulously calculated insulin doses and charted carbohydrates? Did he really hate diabetes? Would he choose not to adopt a child who had diabetes because he hated it? He said he hated diabetes for all the times it took our son from us: when he had high blood sugars and couldn’t concentrate or when he had low blood sugars and was too weak to participate in family activities. Nonetheless, he agreed it would be nice to have another child. He agreed we would make good parents to a child with diabetes since we had become good at managing “the beast” over the years. He thought that it would be nice for our children to have another sibling; for Michela to have a sister to look up to her and with whom she could share secrets. For Trent to have another child with diabetes in the family. This child would be good for our entire family. Even if that meant inviting diabetes into our home once again. My husband told me to follow up and inquire about the baby. I emailed my friend, “I have been speaking with Tim about the baby . . . . We might be interested in adopting her or even taking her for foster care if that were the only option. Is there a way you could put us in touch with her caseworker? We have always wanted more children. . . .” After a week, which seemed like an eternity, I finally connected with the social worker. I was encouraged when she said she didn’t believe the biological mother or any family members would be able to care for the baby. It was bittersweet to hear that families waiting to adopt infants had been approached but didn’t want a baby requiring a lifetime of insulin injections. Bittersweet because I knew that could be my son who was rejected merely for having diabetes. Bittersweet because I knew my son likely had been rejected in his life for having diabetes. Bittersweet because I knew more than ever that this baby was meant to be mine. After a few phone calls back and forth, the social worker and I agreed that Tim and I would drive out on Friday to meet the baby. And to talk with all involved about how they envisioned the case proceeding. The caseworker told me the baby was gorgeous. She offered to email a picture of her. I was hesitant. I didn’t want to jinx anything. Oddly, she insisted on emailing me a picture. (She later told me that she had not sent pictures to the families who said they couldn’t handle a baby with diabetes because she didn’t want them to take on a baby they didn’t want just because it was good looking. By comparison, she wanted me to fall in love with the baby because I had already agreed to take her, insulin dependent and all, sight unseen.) From the moment I saw Maya's picture, I was in love. "I noticed it was a full moon this evening on the drive home from New Jersey. I noticed the most minute detail of everything around me as though the details were all so important that I had to commit them to memory. The smallest details kept jumping out at me and making me take notice: the fact that it was 7:26 on the clock on my dashboard when I left work; the spices in the chicken sandwich on my tongue included taragon; the fullness of the moon seemed to swell. I thought the moon was appropriate. My heart swelled like that moon. All day I have felt like I am an eagle at the edge of a high cliff about to soar out over the horizon and feel the breeze in my face as I stretch my wings. And yet, I am afraid to move even a muscle or to exhale because I fear losing the perfection of the moment. As though, if I move, I might set events on a course that might take Maya away from me. From the moment I saw her face in the photo on my computer screen today, I have also had a heavy feeling in my stomach. If I hadn’t seen her face, I might have been able to handle it if the adoption doesn’t work out. But now that I have seen her, it seems like it will be a cruel twist of fate if anything goes wrong. She seems so perfect and meant to be mine. Too bad we just threw out all of those sippy cups." I called everyone I knew to tell them that Tim and I might adopt a baby girl with diabetes. Tim’s parents were thrilled; they wanted to be kept abreast of every event that occurred. Tim’s siblings were happy; they would have a little one to guide through her adventure of being adopted into a white family. My father said adopting another child was something he had always wanted to do. My niece wanted to be the Godmother when we baptized the baby. My friends thought I was crazy but wished me luck. The daughters of one of my friends, Monica and Sarah, were overjoyed about hearing about the prospect of my raising a baby with diabetes. And, another friend, a devout Muslim, treasured the idea of having a baby around. My enthusiasm was like the enthusiasm of the children I spoke with: bright and naïve. I had worked while Tim raised Trent and Michela and I had no idea of the demands a baby could make on a parent. I was therefore taken aback at the reaction of my own mother. Only she reacted negatively. Her first reaction was that we had financial difficulties raising the two we already had with all the medical bills. I responded that we could work it out. Her next words were that I was no “spring chicken” to be running around after a baby. I was 45 at the time. My eldest sister MaryLynn was with me when I called my mother. She suggested to my mother that I wasn’t calling for advice but for blessings. “In that case,” my mother responded, “God bless you.” The call ended hastily. My mother had always made it clear how difficult it had been for her to raise 6 kids; how much she sacrificed; and how sometimes she wished she had fewer children. She always emphasized that nonetheless she loved us all deeply. Later that week, she proved her ability to love her 16th grandchild as she loves her own children and all the other grandchildren. 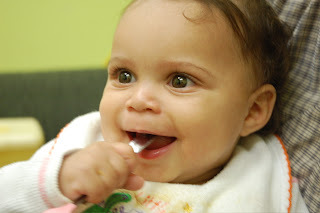 Knowing that Tim and I were determined to adopt the baby, she gave me a bit of advice before we went on our first visit that Friday: “Michelle, if that baby is teething, you need to bring those Zweibac teething biscuits with you. That will soothe her gums. Or maybe one of those rattles filled with water that go in the freezer for her to chew on.” My mother had fallen in love too. Yup, you're amazing and loving and wonderful! I loved reading this.